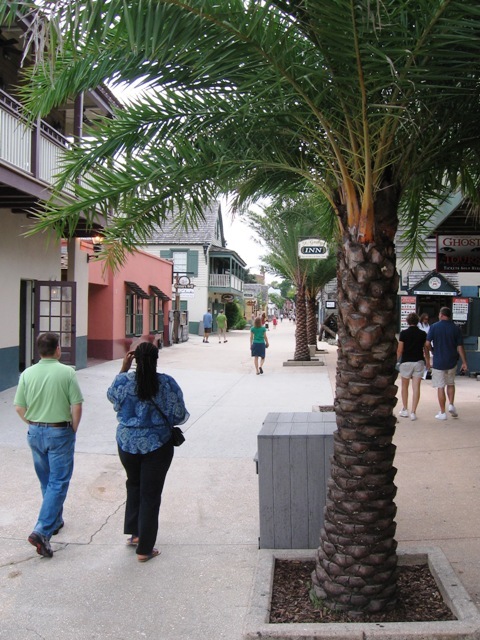 Judging by St. Augustine, Florida’s East Coast is getting all gussied up. In my memory, St. Augustine has always been a pretty city, but since it has been more than thirty years since I last visited this city (about halfway between Jacksonville and Daytona Beach) my memories of it were dim. Anyhow, whatever it was when I first saw it in 1972, it does not match the tourist-friendly, picture-postcard reality I find in 2012. It is both beautiful and charming. St. Augustine has a right to call itself historic in a way that no other city in North America can. While a newbie of a city by European standards, St. Augustine can viably claim to be the oldest city in North America. It was officially established in 1565, which is forty-two years before the English got around to attempting to settle North America at Jamestown (1607 for the fort, 1619 for the city) and 55 years before the first Pilgrims arrived at Plymouth Rock in 1620. It was the Spaniards who founded St. Augustine. It looked like a good place to place a stake in North America, as it was reasonably defensible due to peninsulas and fresh water could be found nearby. It attracted attention from competing powers, which led to the establishment of many forts that predator nations quickly destroyed. Once Spain decided they weren’t going to budge, they finally constructed the fort that endures today: the Castillo de San Marcos, a huge fort made of over 100,000 blocks of limestone. Should navies want to invade today, it would still be reasonably impregnable. If you had to find shelter in a hurricane, it would be an obvious place to weather one. Various nations laid claim to the city over time: Spain, then Great Britain, then Spain again and finally the United States got title to it in the 1830s. If the United States is destined to go the direction of other great powers, then it won’t be the last occupier of St. Augustine either. Whichever nation ends up with it in the future, it is likely that Castillo de San Marcos will still be standing looking relatively unchanged. 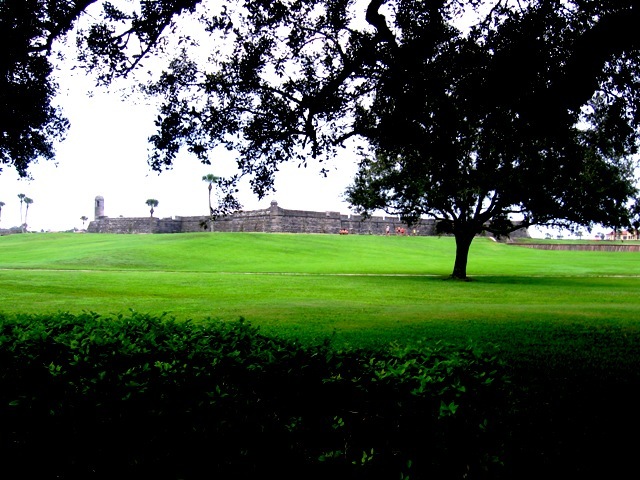 Meanwhile, the fort remains St. Augustine’s premier attraction, competently administered by the National Park Service, with regular cannon firings to delight the tourists during certain times of the year, as well as a fantastic view of the junction of the Matanzas and North Rivers, with hints of the enormous Atlantic between the peninsulas. I didn’t have to go far to see the fort because it’s where business has taken me this week. Our meetings were not actually in the fort, but in its administration building. This is good because unlike the fort, it is air conditioned. Given the oppressive humidity and frequent storms in St. Augustine, it’s a wonder that the Spanish did not settle in more temperate terrains. The Spanish influence is not wholly gone. Some of the architecture from their occupation still exists, and much that went up around the city is built in a Spanish style. And you can find still Spanish restaurants here too. We found one with excellent food on Tuesday night on St. Georges Street, a lovely pedestrian-only street that slices through the historical downtown St. Augustine. St. Georges Street is a lovely tourist destination and full of boutiques. In September the tourists have mostly gone, which is how we claimed a government rate at the famous Casa Monica hotel here. This famous and historic four-star hotel is lovely, comfortable and tries to keep it faithful to its historic style, right down to the high skylight windows in the bedrooms, such as I have in my room. If you want privacy, roll down the blinds. You can’t go a block without running into wonderful restaurants (in fact, the hotel itself has a four-star restaurant), but curiously most of them are not open for breakfast. Those that are tend to open around 8 a.m., which is too late for those of us needing to be ready for all day meetings starting at 8 a.m. That leaves pricey room service or dining at the Starbucks in the lobby. The closest thing to health food there is their breakfast sandwich, which has plenty of protein (eggs) but is otherwise largely tasteless. But who can complain with the view here in the downtown area? Flagler College is anchored here, and the private university looks more like a hotel than a college campus, which it likely was. Unsurprisingly, it attracts well moneyed students, mostly white. Their beautiful coeds make me wish I were thirty years younger. Well-manicured lawns full of Bermuda grass, lots of historic houses and brick streets, tall and established palm trees helps you forget the oppressive humidity. The humidity is so high that thunderstorms are frequent. The remnants leave large puddles on the streets pedestrians have to walk around. The city is obviously going for a classy clientele, at least here in the downtown area. The major roads include bike lanes. Many roads are under reconstruction. As a result driving around downtown is confusing, with its narrow streets recalling a pre-automobile era. Yet, while it has a cosmopolitan look, you don’t have to drive too far to be in Florida Cracker territory. Even so, there are plenty of well-moneyed people here. The city has the appearance of being progressive, but the area is dominated by Republicans and conservatives. Romney should not have to worry about winning St. Augustine. St. Augustine is the sort of Florida I hoped we would move to when my family arrived in Florida in late 1972. Instead we ended up near Daytona Beach, at least then a much grungier, pedestrian and low-brow place. In Daytona Beach in 1972 there was the beach, the bars, the liquor stores, the famous speedway, a Greyhound track, a Jai-Alai center, a lot of suboptimal retail, and little else. But here in St. Augustine, at least in 2012, all is much newer, spiffier and classier. The last state I want to retire to is in Florida, but if forced to retire in this state then St. Augustine would do quite well. Just how Daytona Beach and my old home city of Ormond Beach just north of the city is doing in 2012, twenty six years since I last visited and where I spent about six years of my life will be the subject of my next post. Oh this was wonderful! Either St. Augustine or Florida, or both should now pay you for the wonderful write up that has me eager to check this city out. Like you, I could never understand the draw to Florida as the place to retire. To put yourself in a state that Mother Nature is brutal with 3/4 of the time mystifies me. We would go to Disney World every fall & my husband once said he’d like to retire to Orlando so he could be closer to the park, but I could never deal with the visions of an 80 year old man (someday) screaming his head off on Rocking Roller Coaster.